The New World Luncheon Fundraiser! Hey everyone! 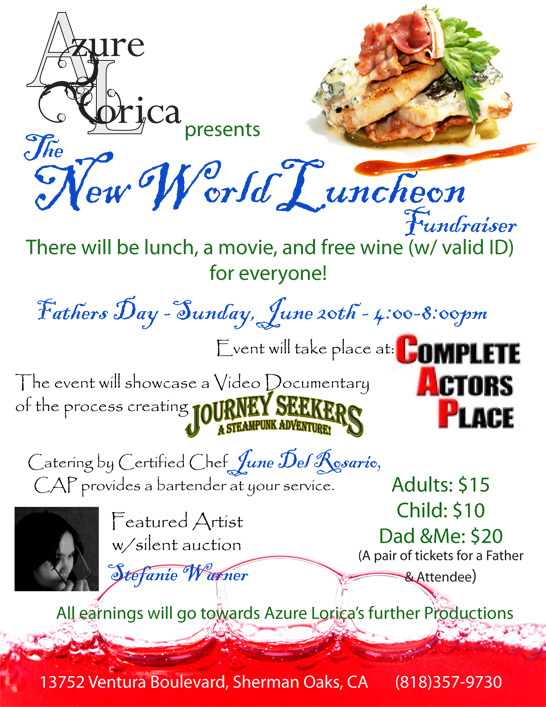 Azure Lorica is continuing this summer with a fundraiser at Sherman Oaks, CA. in the Complete Actors Place! We will have Rustic Cuisine served by our Chef June Cris Del Rosario, an Art Gallery and silent auction by Stefanie Warner, and a Documentary Film of our recent production- JOURNEY SEEKERS: A Steampunk Adventure! Pingback: Azure Lorica 2010 « AZURE LORICA, INC. Previous Previous post: How to host your own themed event.